Bath time doesn’t need to be a regular thing. 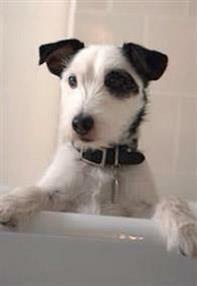 But if your dog’s been rolling in something whiffy or their fur is saturated with mud, then it’s time for a bath! You should use lukewarm water and dog shampoo that has been especially designed for use on a dog’s coat, or visit your local groomer! If your dog’s not already wet, start by brushing their coat to get rid of any knots – water could make these worse. Then put enough lukewarm water in the sink or bath to come up to your dog’s knees – or turn on the shower nozzle at a comfortable temperature. A non-slip mat is a good idea too. Now lift your dog into the bath, with lots of encouragement and praise. Hold them in place with one hand and ladle water over their coat with the other. Or you can use the shower nozzle, holding it really close to your dog’s coat so they don’t get nervous. Apply the dog shampoo and gently work it all over their body. Use a sponge to wash their face – being really careful not to get any soapy water in their eyes. Rinse thoroughly, using clean, lukewarm water so that you don’t leave any shampoo behind. Dry your dog with a towel. Remember, what you don’t dry off, they’ll always shake off! One last thing: check your dog’s ears are really dry, as bacteria love to hide in damp ears. Then praise your dog, reward them and cross your fingers that they don’t dive straight back into the mud!